Join us for a book talk and signing by Harvey Frommer (MALS) of When It Was Just a Game: Remembering the First Super Bowl. Berry Library, north end of level 1. Refreshments served. 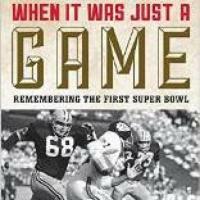 Join us for a book talk and signing by Harvey Frommer (MALS) of When It Was Just a Game: Remembering the First Super Bowl (Taylor Trade Publishing, 2015) in Berry Library, at the north end of level 1. Written by acclaimed sports author and oral historian Harvey Frommer and with an introduction by pro football Hall of Famer Frank Gifford, When It Was Just a Game tells the fascinating story of the ground-breaking AFL–NFL World Championship Football game played on January 15, 1967: Packers vs. Chiefs. Filled with new insights, containing commentary from the recently discovered unpublished memoir of Kansas City Chiefs coach Hank Stram, and featuring oral history from many who were at the game—media, players, coaches, fans—the book presents back story and front story in the words of those who lived it and saw it go on to become the Super Bowl, the greatest sports attraction the world has ever known. Archival photographs and drawings help bring the event to life. Nominated for Pen Award for Literary Sports Writing, 2015. Harvey Frommer is a noted sports author and oral historian. He has written more than forty-two sports books including Remembering Yankee Stadium, Remembering Fenway Park, and the autobiographies of Red Holzman, Nolan Ryan, and Tony Dorsett. Cited in the Congressional Record and by the New York State Legislature as a sports historian and journalist, Dr. Frommer is a professor in the Master of Arts in Liberal Studies Program.